Dr. Oz recently featured Raspberry Ketone as a great natural weight loss alternative. He praised it for its ability to effectively target fat cells and increase the hormones in your body that allow you to get thinner more effectively. He was impressed with how quickly most users experienced results from Raspberry Ketone, with many seeing a difference in as little as one week! Today I have a secret recipe that will show you how to easily recreate Houlihan’s baked potato soup at home. Their baked potato soup is rich, creamy and hands down one of the best around. Prick washed potatoes & bake until a fork pierces to the center easily. Remove potatoes from oven & allow to fully cool. Remove skin & cut potatoes into 1/2″ cubes. Set aside. Melt butter in a large saucepan. Add onions & saute over low heat for 10 minutes or until onions are translucent. Don’t allow onions to burn. Add flour to onions & butter and cook 4 – 5 minutes, stirring well until flour is absorbed. In a separate container, combine water, chicken base, potato flakes & seasonings. Stir or whisk thoroughly to eliminate lumps. Add slowly to onion mixture, stirring constantly so no lumps form. Increase to medium heat & continue cooking until the soup begins to gently simmer. Add milk & cream, stirring until smooth & lightly thickened. Simmer for 15 minutes. Do not boil. Soup should just simmer lightly. Add cubed baked potatoes & stir to combine. Remove from heat & serve. 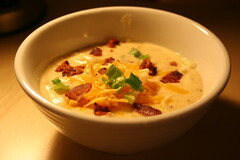 Top each serving with grated cheddar cheese, sliced scallions & bacon pieces.. If you want to earn up to $315 a day and you don’t mind writing some short opinions up, this is the perfect opportunity for you! 2) Single Mom Cuts Her Grocery Bill By 90% Each Month. Combine cream cheese, Cheddar cheese and dressing mix. Let stand for 10 to 15 minutes. Clean mushrooms and remove stems. When cheese has rested, use a teaspoon to fill mushroom caps. Combine flour, 1 1/2 teaspoons salt and cayenne pepper in a small bowl. Pour milk into another small bowl. Dip mushroom first in milk and then in flour. Do this twice. Put coated mushroom into the freezer for at least 3 hours. When mushrooms are frozen, heat oil in a deep fryer to 350 degrees F. Use enough oil to cover mushrooms completely. Fry for 8 to 10 minutes until golden. Drain. Let sit for a couple of minutes before serving.